You have that perfect piece of land, by the water or in the mountains, but you need a structure to enjoy it. 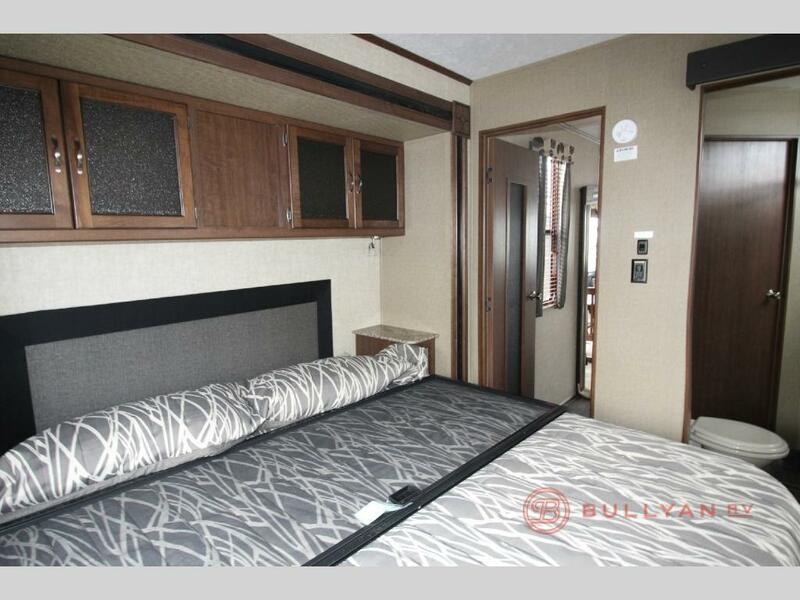 Look no further than the Keystone RV Retreat 391FDEN Park Model for sale. This park model is the picture of luxury and a perfect place to recharge your batteries. The perfect park model for your favorite view. Raised bar top with stools so you can keep the cook company. Double kitchen sink with overhead storage. Three burner range with oven and microwave. Pantry and lots of cabinets for kitchen necessities. Residential refrigerator to keep your perishables cold. Live it up in the Retreat! 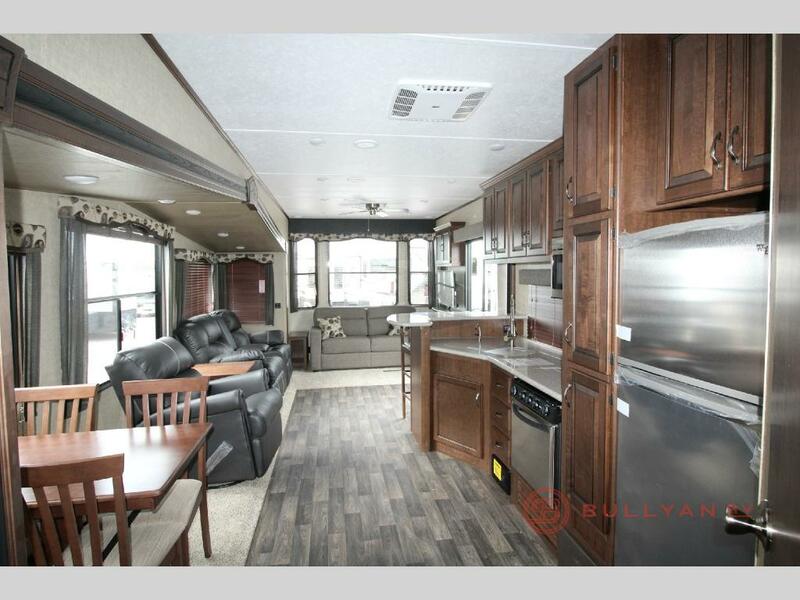 If you are looking for a great place to kick back and relax, look no further than the den/living space in the Keystone RV Retreat 391FDEN Park Model. Kick back on the sleeper sofa, lounge chair or one of the two theater seats and catch a movie on your HDTV while the fire keeps you toasty warm. There is also a free standing dinette perfect for meals or game nights. When it’s time to get cleaned up and get a good nights rest, you will find a shower, sink and toilet with linen storage on the way to the bedroom. There is also a second entrance into the bath from the master bedroom. A good night’s sleep awaits you. The master bedroom continues the theme of spaciousness in the Retreat park model. This bedroom features a king bed slide with overhead storage and one nightstand. There is also an armoire and dresser to store all of your things. You will also enjoy your own private exterior entry door. 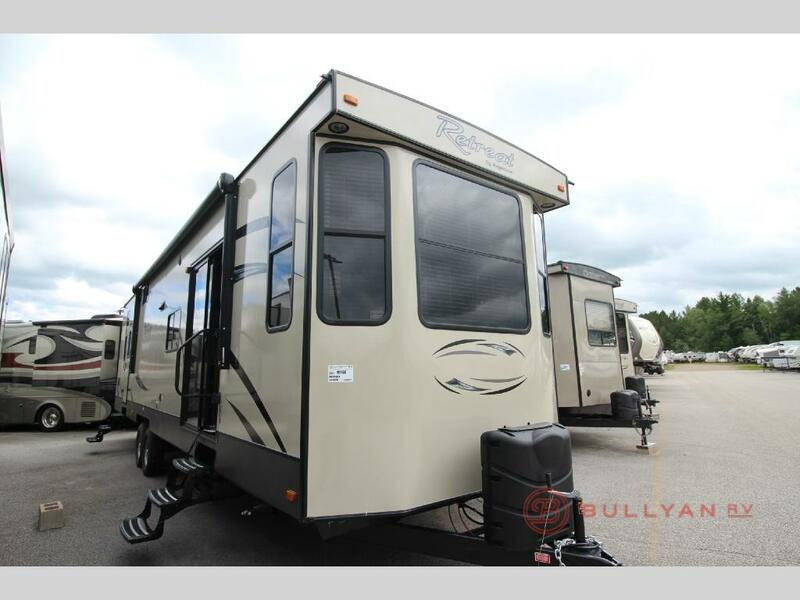 With even more additions items such as ceiling fans in the kitchen and master bedroom, and a beautiful exterior awning, you can really make the Keystone RV Retreat 391FDEN Park Model your home away from home. Contact us today for more information or just stop by and our friendly staff is here to help in anyway we can!